once-a-week blogging from now on. i know that i need to cut ‘way back’ on all communication via technology. i’ve been spending too much time with machines. if you really look, it should give you pause. I’ve been on the internet a lot less, but it’s been more from circumstance than something I’ve actually planned. Love this saying. I’m not a huge fan of rain–not the constant kind as the chilling kind in Ohio is hard on osteo arthritis, but spring rains are another story and I do not mind a shoe-full of slosh (I mean slosh not slush) when the buds are playing ‘peek-a-boo’ with me. yep. as long at the sun comes out the next day to dry out the shoes and my bones. 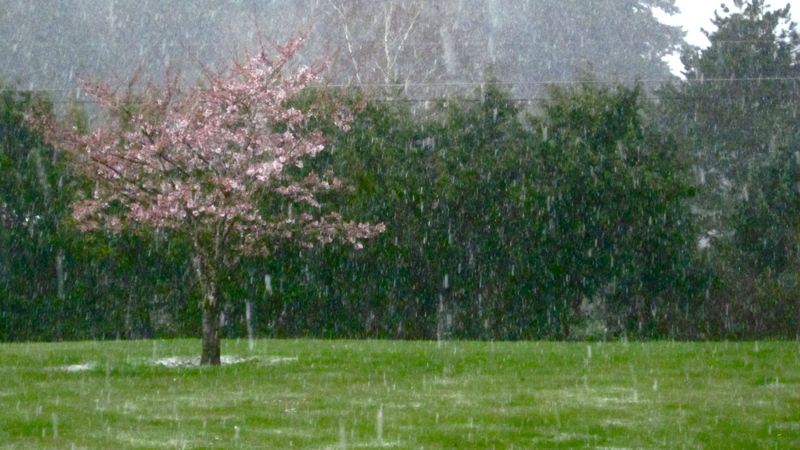 We had snow here Saturday morning — pacific northwest spring. yep, but, you wear boots. sensible woman that you are….no slush gettin’ in those, baby! Less computers. More slush in the shoe. I vote for that. and more time for painting. You will not, I repeat, will not be needing Google Glasses. Great Easter Colors! I know what you’re saying, It’s like being controlled by technology. Spring is a good time to separate from technology and get back into the garden and earth. Have a blessed Easter Davis.